Its almost Friday, 5 days since my last post. Mmm.....wish I can post more frequently. The between posts is getting wider and wider. This picture been sitting on my desktop for the last 4 days and I kept getting distracted although I kept telling myself to post it - everyday. 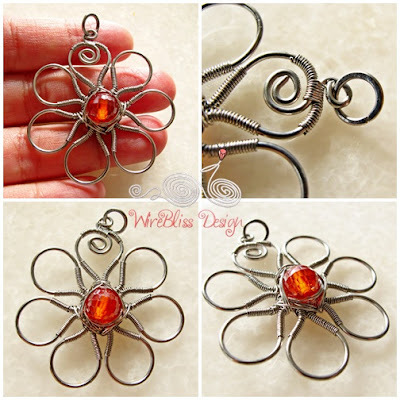 This wire wrapped flower pendant looks familiar? Yeah, here's my first one. Only, this time around there are 7 petals instead of 5. Another one similar to this design is the next project. Hope to finish it this weekend. Hey Mei how are you...busy I see! I loved the first pendant and this one is equally as pretty...you have such talent! Hi Heather, yeah busy with work these days. Wow! This one looks really beautiful!